I noticed that when I started to treat my direct sales business as a business, rather than something I did on the side, it started to grow. Massively. Instead of just doing the parties, working to get bookings, and fulfilling orders (working in my business), I began to work on activities to grow my business (working on my business). The most important thing I did to make this work was to set aside time to do the things that would help me to get ahead. And I made my business portable so I could work in small pockets of time. When I started to plan my time across all aspects of my business to keep a balance in my efforts things started to really improve. I made sure I worked in the business to deliver awesome service and maintain an income now, and I worked on the business for future growth. Balancing your energies and efforts is important. For example, if you only spend your time and energy on finding new people to sponsor, you will soon run out of party bookings and your business and orders will fizzle out. But if you only spend time on getting new bookings, you’re not growing your team and you’re running on the spot (just faster). Like the circus act, you have to keep all the plates spinning or they’ll fall and break! To help me maintain that balance and keep myself focused, I developed my own weekly planner. I found using this planner to be super helpful because once I started to actually allocate times, I stopped trying to do everything all the time. I stopped replying to messages, making host coaching calls, or be on social media while really I wanted to be with my children. Now I could be with the children and give them my full attention because that was time I had freed specifically to be with them. During the times I had allocated for business activities, I was able to focus and be more productive because I wasn’t trying to do 5 things at once while feeling guilty for not spending enough quality time with the children. I also negotiated times with my husband to work in my home office for a few evenings while he organized the kids so I could work on my business, adding to my available work time. Using the planner stopped me from feeling overwhelmed because the boundaries between work and home life were no longer blurred. When I was with the children, that was my time with the children. When I was at work, I could focus fully on work and be productive. Using the planner also helped to plan other important activities for myself, such as exercise, date nights, etc. 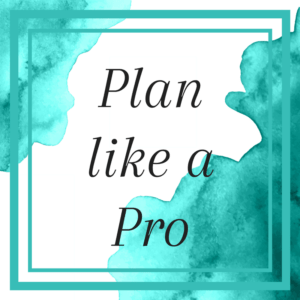 Self-care is important and the planner helped me to make time for it. To focus my work time, I used specific to-do lists for each aspect of my business, such as party bookings, sponsoring, host coaching, etc. This meant I could walk to my office and be immediately productive because I always knew what I had to do. Additionally, I created folders for each of those aspects of my business. This way I could grab a folder and start work and have everything on hand that I needed. This also made my business portable. If I had some waiting time, for example waiting at gymnastics or basketball, I could grab a folder and my to-do list and make these times incredibly productive. Waiting for the kids never felt like wasted time. Even if you only have 15 minutes, you’ll be surprised by how much you can get done if you’re organised and ready to work. Over the years I’ve trained many people on this system (using a weekly planner, business to-do lists and folders). 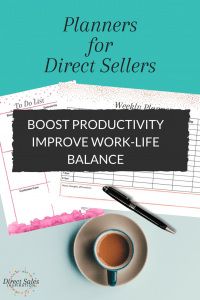 The people who actually implemented this system in their life reported a big boost to their business and a big increase in the quality of life as their work-life balance improved. 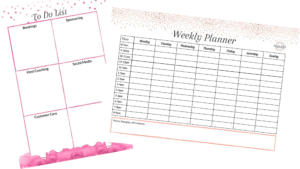 Grab the Planner download and print it off. You’ll find a timed version and a version without times so you can put your own time blocks in. You’ll notice that it’s divided in hourly blocks of time and the days of the week. Now cross out the times you definitely can’t work on your business because you have other commitments. Also cross out the times you need to keep fee for personal time, such as exercise, time with family, etc. Alternatively you can write in these time blocks what you’re doing. Now look at the times you have left. That’s the time you can allocate to working on your business. Grab a highlighter or colored pens and allocate some time to each aspect of your business (bookings, sponsoring, host coaching, customer care, social media, or other). Some people like to write in the time blocks what activity they’re doing, some people use color coding and highlighters. Use whatever works best for you. Grab the To-Do List download and print it off. On the sheet you can see the different headings that correspond with different aspects of most direct sales businesses. There’s also an unlabeled spot for your specific needs (or you can use it for notes). Now sort all your business activities for this week under the various headings. Use the To-Do List headings for your folders. You can put everything you need to complete the tasks in these folders so you can easily grab them when you have a pocket of time. So you’d have a Host Coaching folder, a Bookings folder, a Sponsoring folder, etc. So there you have it: the complete system to plan time to work in your business and on your business and you’ve made your business portable! I’d love to hear how you implement these tools in your business and which topics you add to your planners. Remember to send me a message and let me know. 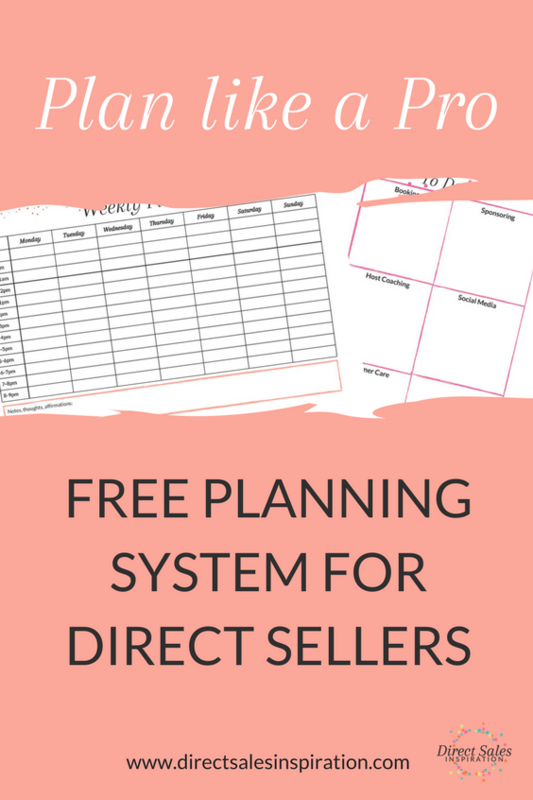 Sign-up to get the Planner and the Direct Sales To Do List. You'll also receive my weekly email - never miss a free printable again! Thanks for the heads up Kirsty! Turns out I managed to break every single form on the site!!! Well done me 🙂 Anyway, it’s all fixed now and if you try again it should work and you’ll be send the planner and to-do list! Enjoy.